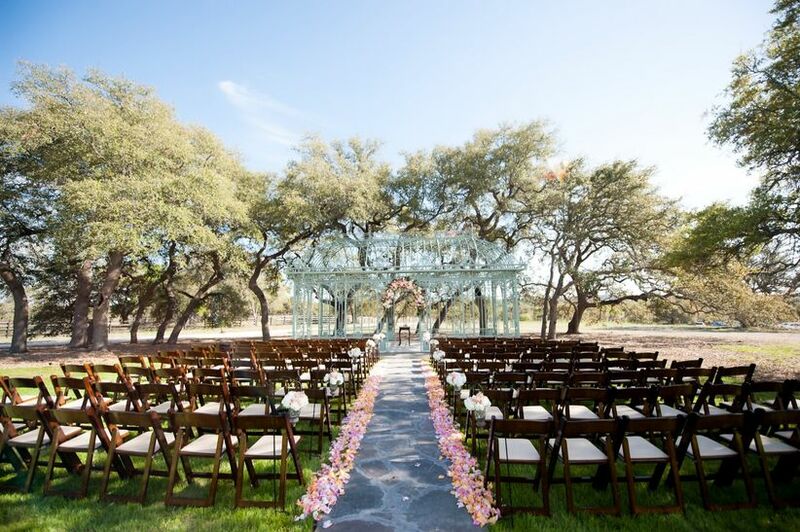 Browse these spectacular ceremony setups from real weddings and prepare to be inspired! Vowing to love and support your spouse for the rest of your lives is a surreal and moving experience that will become etched into your memory. Set the stage for the unforgettable “I dos” to come with a beautiful backdrop that reflects your theme and venue. Traditionally, chuppahs and mandaps play a pivotal role in Jewish and Hindu weddings because of their religious and cultural symbolism. 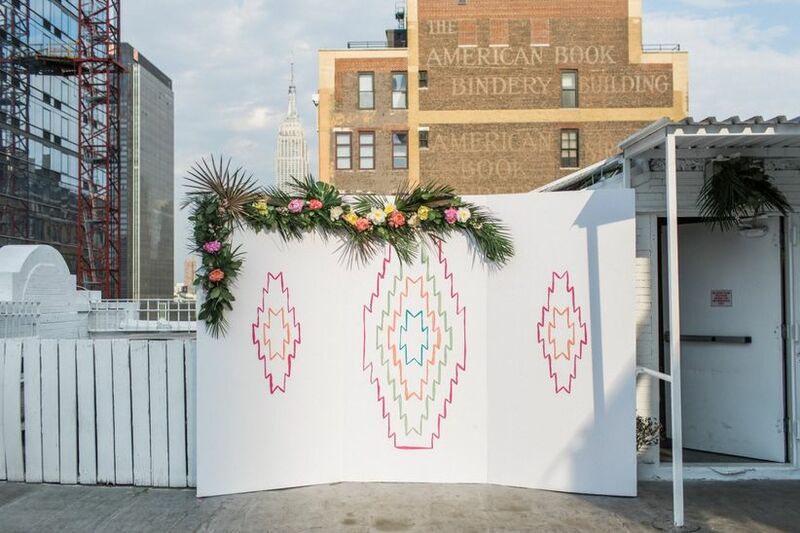 Now couples of all faiths are finding creative ways to incorporate decorative structures into their nuptials and mark the start of their married life together. 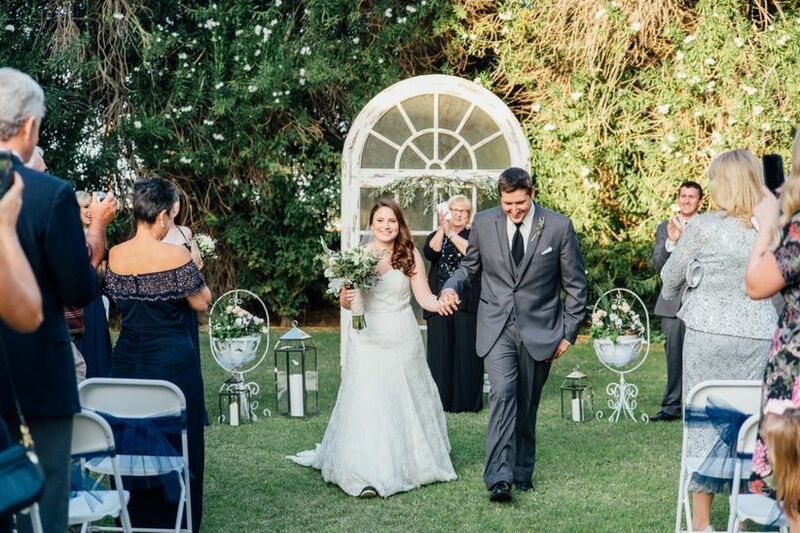 Choose from canopies, arches, floral walls, arbors, and more to help define your ceremony space and create a focal point for your outdoor wedding. 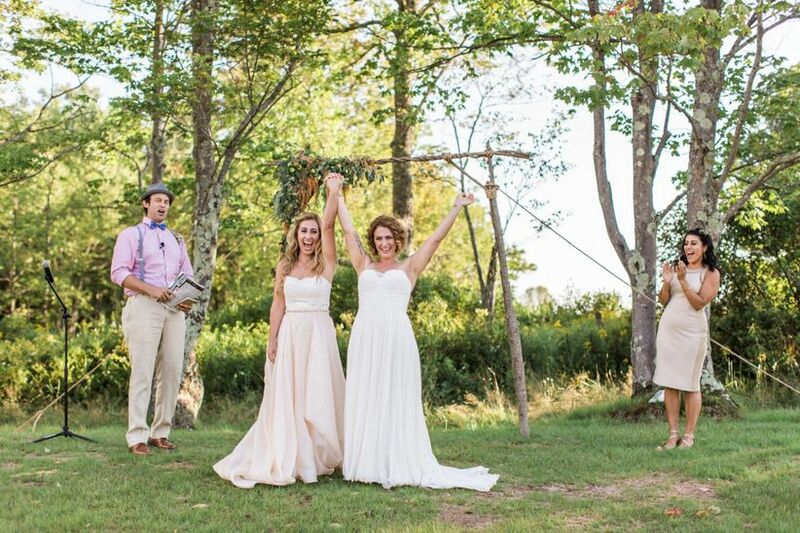 Whether you’re exchanging vows on a beach, garden, rooftop, or barn, we’ve got you covered. 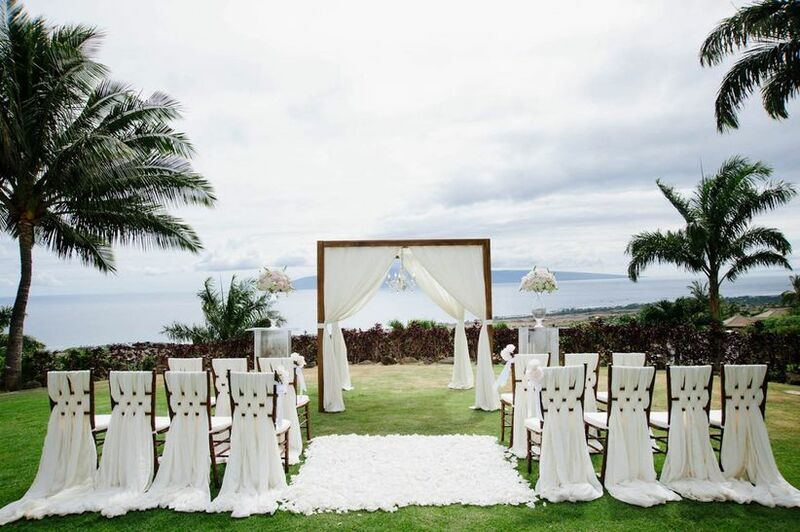 Browse these spectacular ceremony setups from real weddings and prepare to be inspired! Why settle for just one arch when you can have triple the flower power? 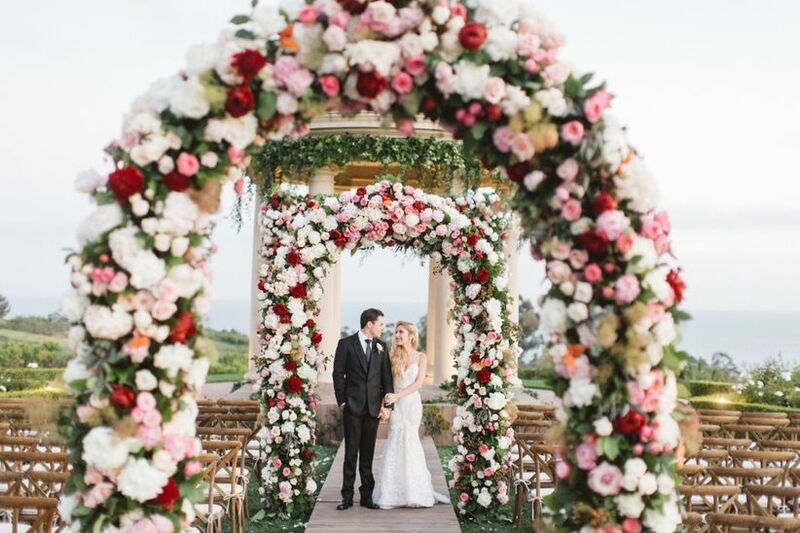 Bloom Box Designs constructed a few different floral archways packed with pink, red, and white blooms, resulting in an opulent look that’s fit for a fairy tale. If your wedding site features a gazebo, adorn the doorway with a garland of flowers or suspend pomanders from the ceiling. 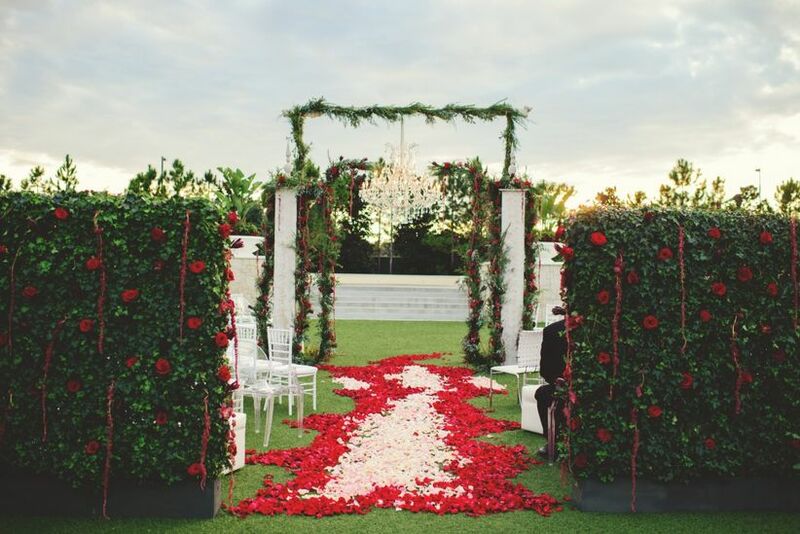 Ask your florist to cover the structure completely with vines for more of an overgrown, enchanted garden feel. A trellis draped in gauzy fabric and accentuated with groupings of greenery is gorgeous without being too fussy. It’s a great option for a private estate or backyard wedding. 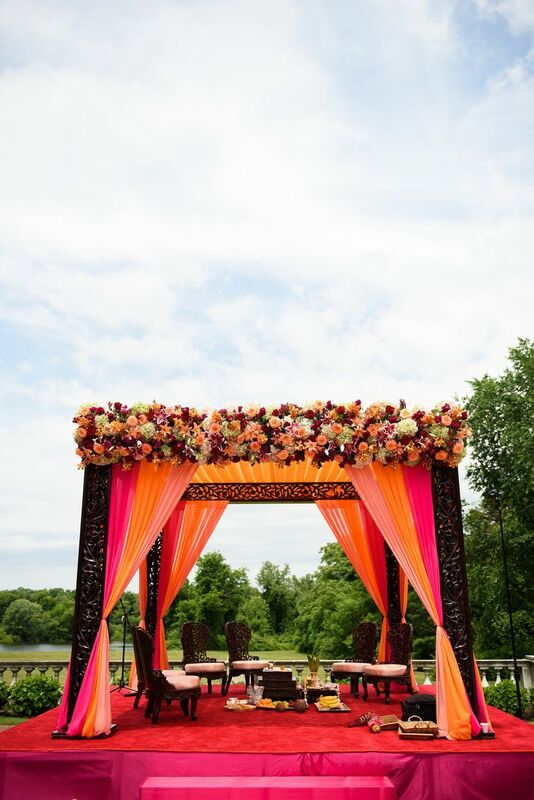 Inject a bold pop of color into your wedding décor with a wooden chuppah showcasing vibrant, in-season flowers. As a bonus, this type of structure is easy to repurpose at the reception; your florist can break it down into different floral arrangements or keep it intact and use it to frame the sweetheart table or cake. For this wedding at the New York Botanical Garden overlooking the Bronx River, Diana Gould Ltd. designed an understated arch that blended in with the majestic evergreen trees. From the flower-topped lanterns to the petal-strewn aisle markers to the drop string lights, we’re obsessed with every exquisite detail. 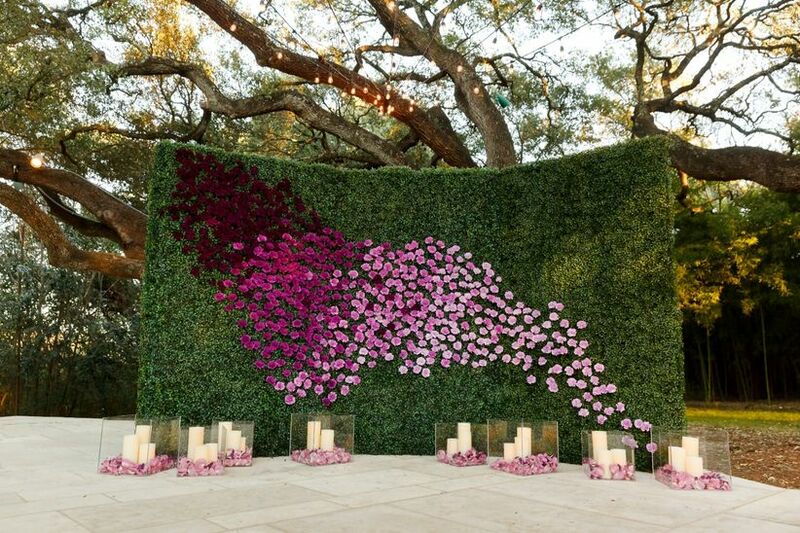 Venue: New York Botanical Garden; Floral and Event Design by Diana Gould Ltd.
A flower wall makes for spectacular photo ops – guests won’t be able to resist Snapchatting selfies in front of it post-ceremony! 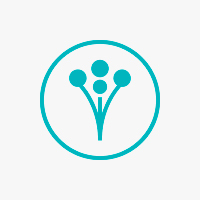 The striking ombré pattern of this design was created using budget-friendly carnations. Pillar candles in clear cubes complete the luxe look. 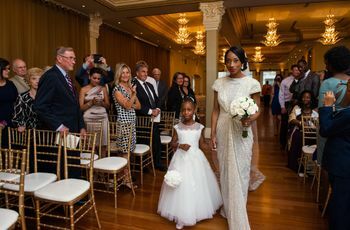 Add a glamorous feel to your ceremony space by saying your vows beneath a dazzling chandelier (work with your coordinator to ensure that your structure is sturdy enough to support it). 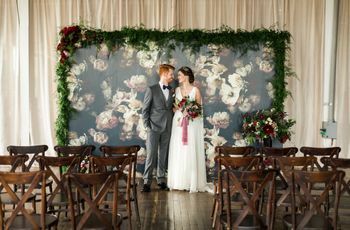 Greenery hedge walls dotted with red roses and garlands reinforced this couple’s “dark romance” wedding theme. 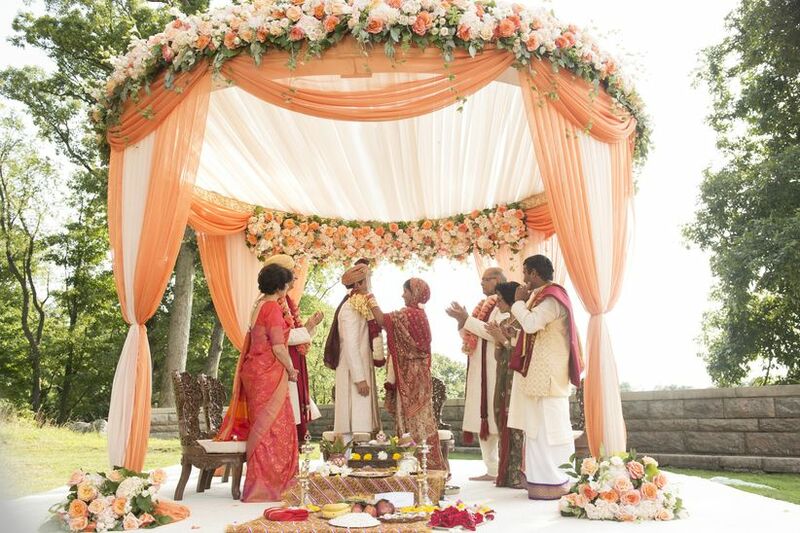 In a traditional Indian wedding, the mandap is a covered canopy that symbolizes prosperity and the bond of the family (the four pillars represent the love and guidance of the newlyweds’ parents). Erganic Design built a circular design with zesty citrus hues for this bride and groom’s summer celebration. Mandaps traditionally include red and gold, but more Hindu couples are switching it up with different colors. Black adds an edgy and on-trend element to this neon-bright style by Erganic Design. Chuppahs are an integral part of Jewish weddings – they symbolize God’s presence and the couple’s first home. 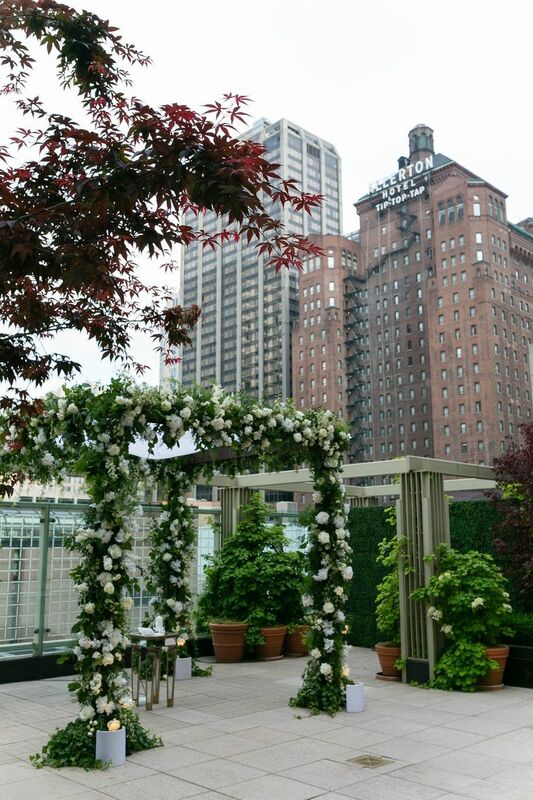 Transform a city rooftop into a garden oasis with an ornate chuppah featuring all of your favorite blooms. 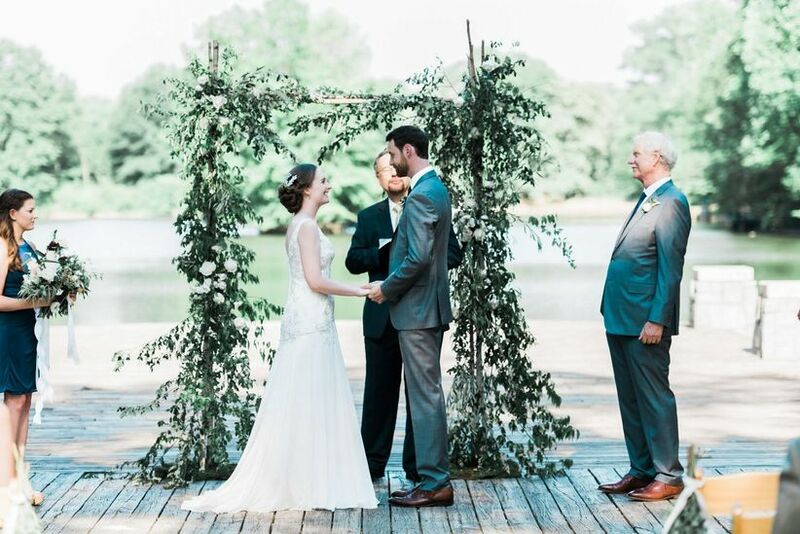 This bride and groom tied the knot in a heartfelt lakeside ceremony. 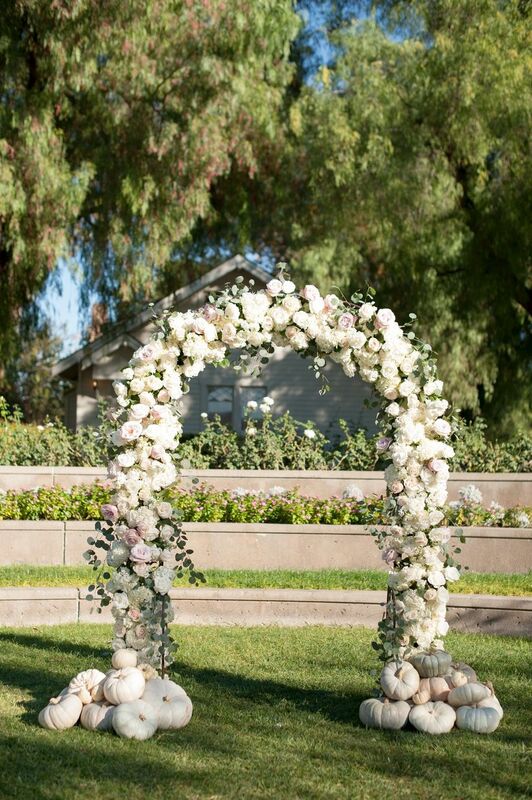 An arbor overflowing with greenery, designed by Vine and Branch, added a wow-worthy touch to their wedding photos. Mix-and-match rentals from Found Vintage Rentals combine to form a one-of-a-kind ceremony altar. STEMS Floral Design added garlands of greenery and hydrangeas to underscore the outdoor setting. 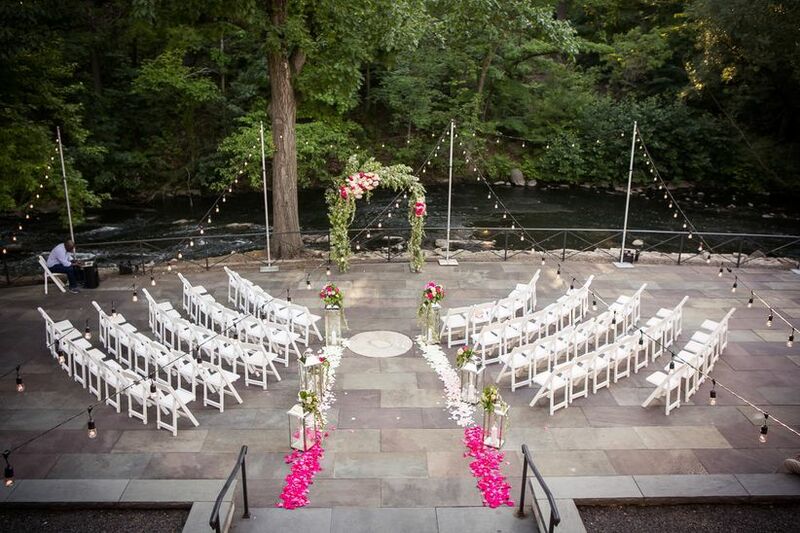 Use your ceremony décor to play up the natural scenery. 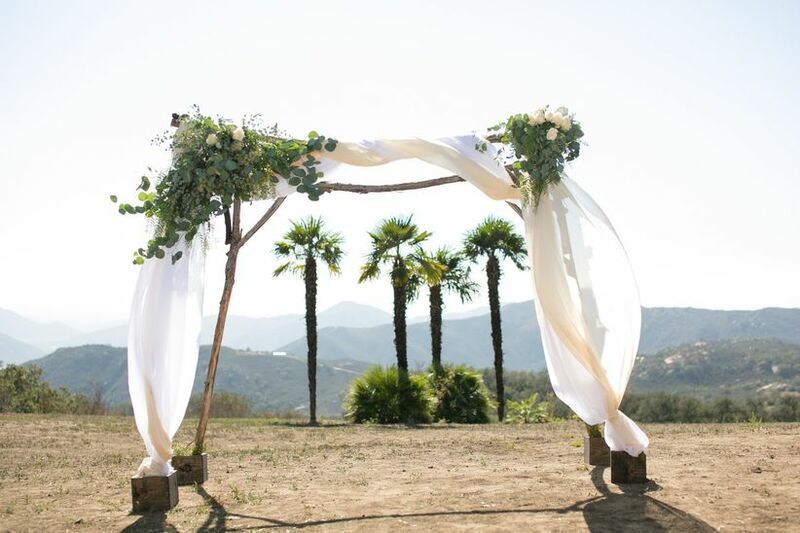 For example, we love how this arch was positioned between two towering palm trees strung with lights. 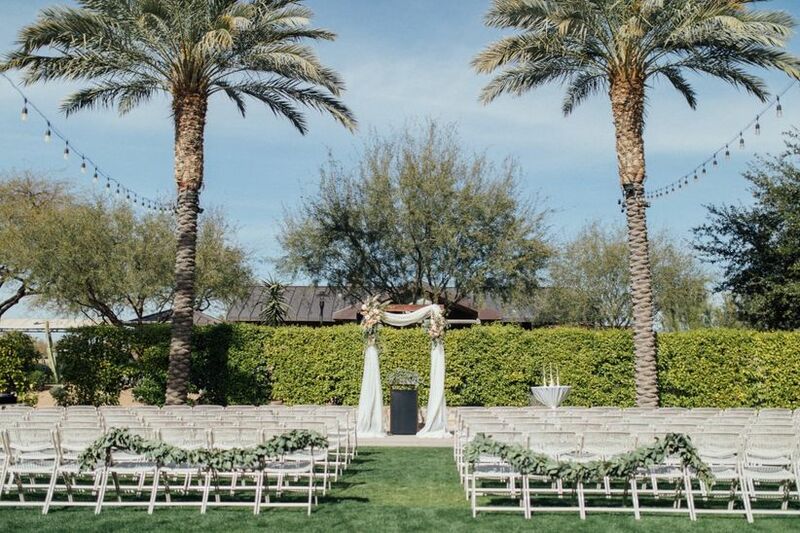 A garland placed on the back row of chairs completes this minimalist-chic ceremony at the The Westin Kierland Resort & Spa in Scottsdale, Arizona. Create a multifaceted ceremony look with décor elements at different heights. 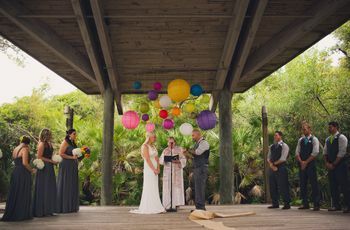 This ceremony featured fabric suspended from the trees, a flower-bedecked cross at eye level, and floral arrangements and ferns down below. 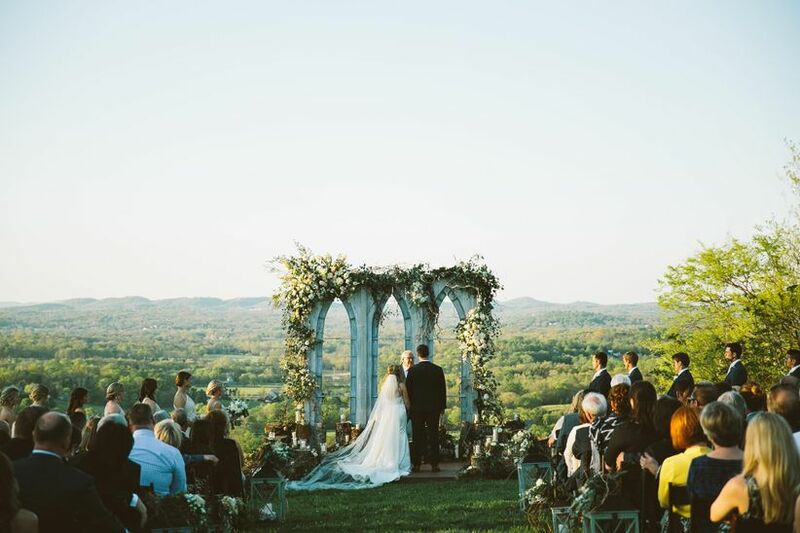 Just when we thought a hilltop ceremony couldn’t get more picturesque, we spotted this dreamy event designed by Fête Nashville. 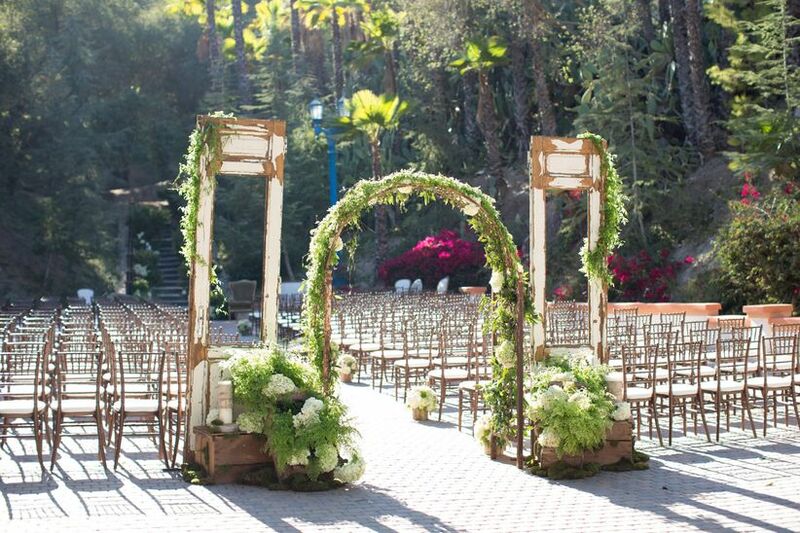 Recreate the look by clustering wooden stumps and flowers en masse in front of a large arch. Create a unique backdrop at the altar by bringing indoor elements outside to define the space. Dang Fine Rentals provided the furniture for this DIY backyard celebration. 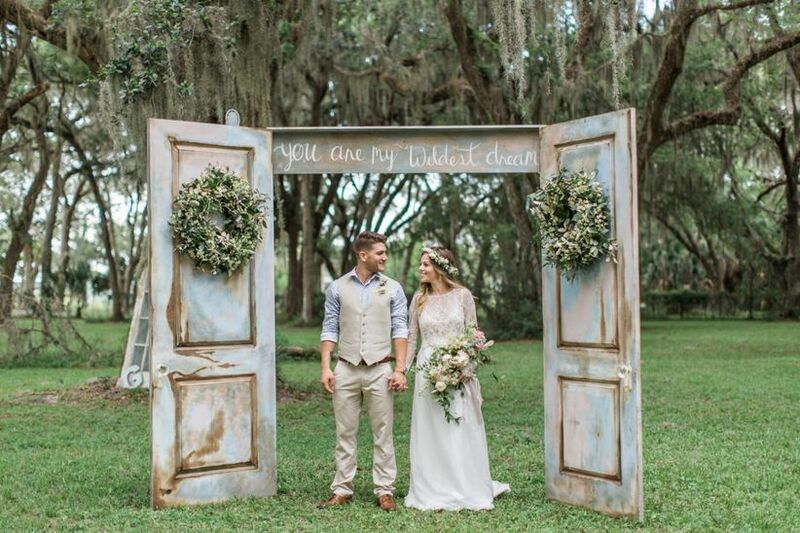 Use antique barn doors to add some structure to your ceremony entrance and make a grand debut. 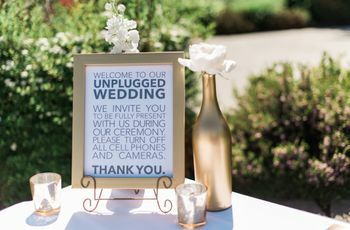 Bonus points if you include a sweet calligraphy sign to connect the two like this couple did. 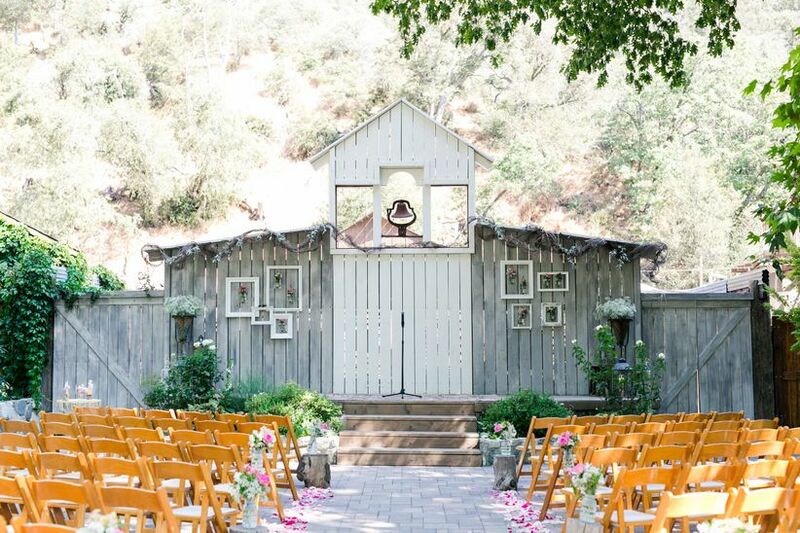 If we could throw the barn wedding of our dreams, this would be it. Framed floral arrangements and intertwined branches add a whimsical flair to a rural locale. 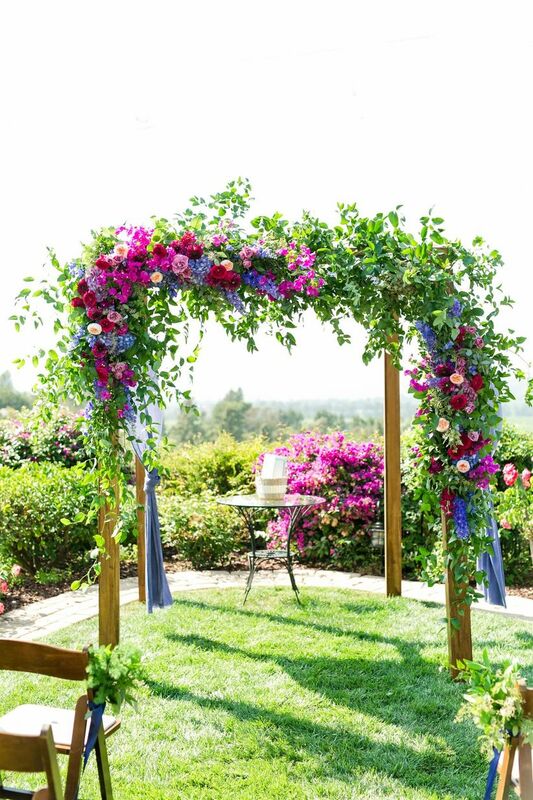 Dress up a basic wooden arbor with asymmetrical flower arrangements and draping for an ethereal backdrop that will complement almost any type of outdoor setting. Floral pedestals on either side add visual interest. Sometimes, Mother Nature really does know best. 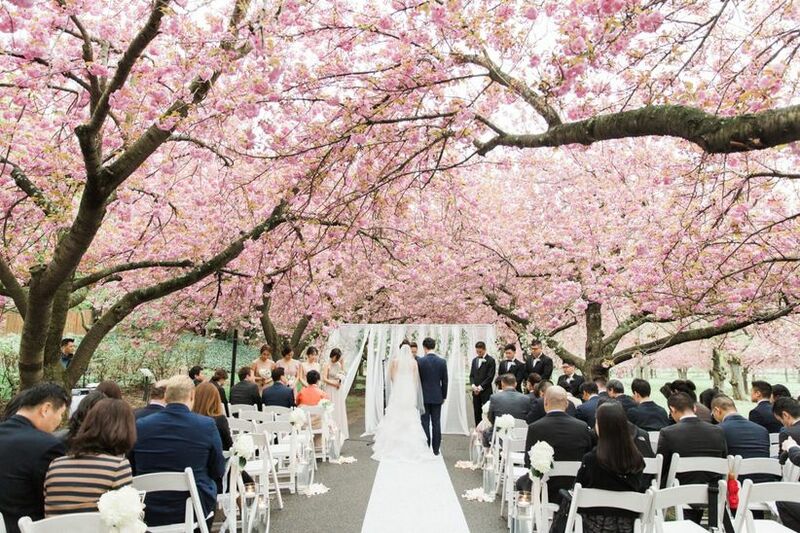 Case in point: These newlyweds exchanged vows before a simple white curtain so as not to detract from the magnificent cherry blossoms up above. Make a bold impression with a giant frame marking the moment that you become married. You can adorn the corners with a few choice blooms or keep it bare for minimalism at its finest. 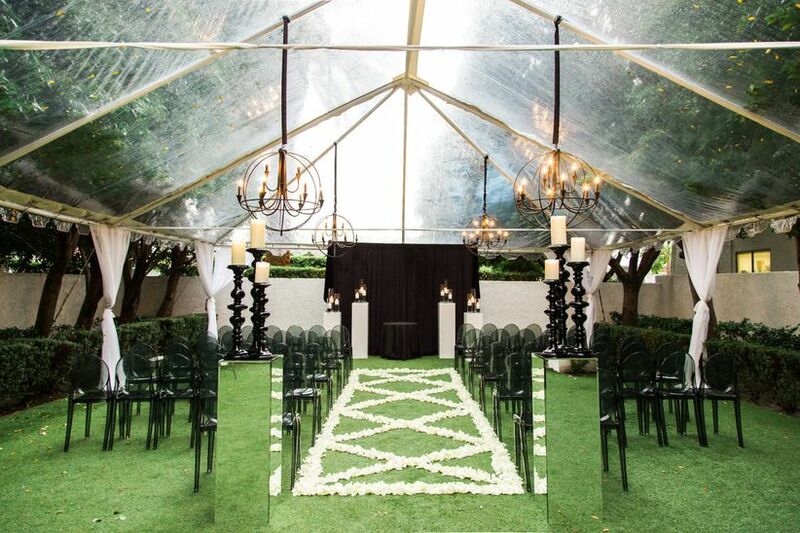 Rain or shine, this tent ceremony shields guests from the outdoor elements while still being one with nature. Mirrored accents, black seating, and flickering lighting fixtures appeal to couples with a modern wedding style. Play up a fun and free-spirited vibe with a funky patterned backdrop. Other unconventional materials that you can use for your ceremony décor include umbrellas, paper cranes, and pinwheels. 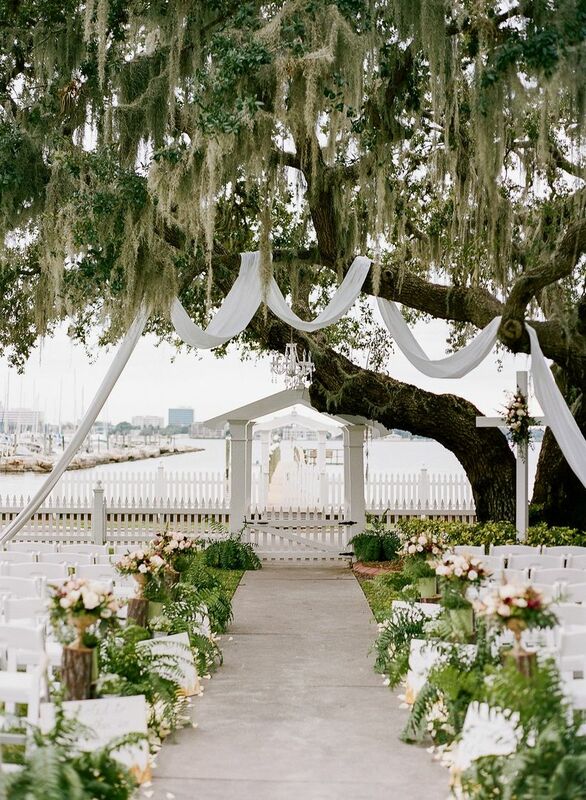 We’ve never seen anything quite like this chuppah, which features trees, Spanish moss, and large air plants! 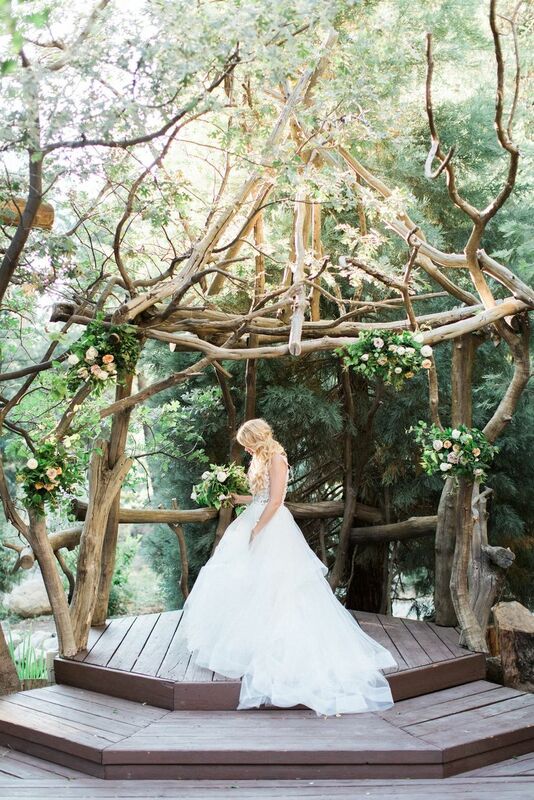 It perfectly fit the bride and groom’s wooded wonderland theme. Branch out of the ordinary with an intertwined rustic wooden arbor. Look closely and you’ll spot fruit dangling from the upper left corner. 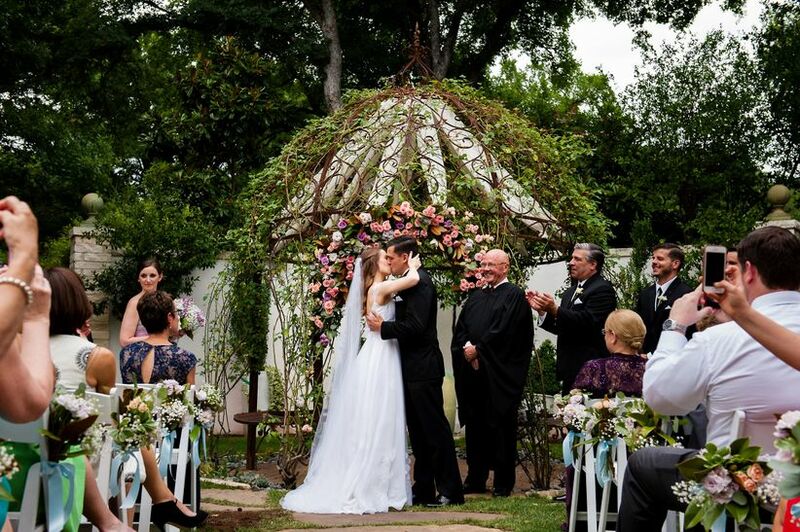 A desert or mountaintop wedding calls for a breathtaking birch canopy with billowing fabric. This one was built into planter boxes, making it easier to transport. Search for a venue with built-in ceremony décor to cut costs. How incredible is this log and pine installation at Arrowhead Pine Rose in Southern California? 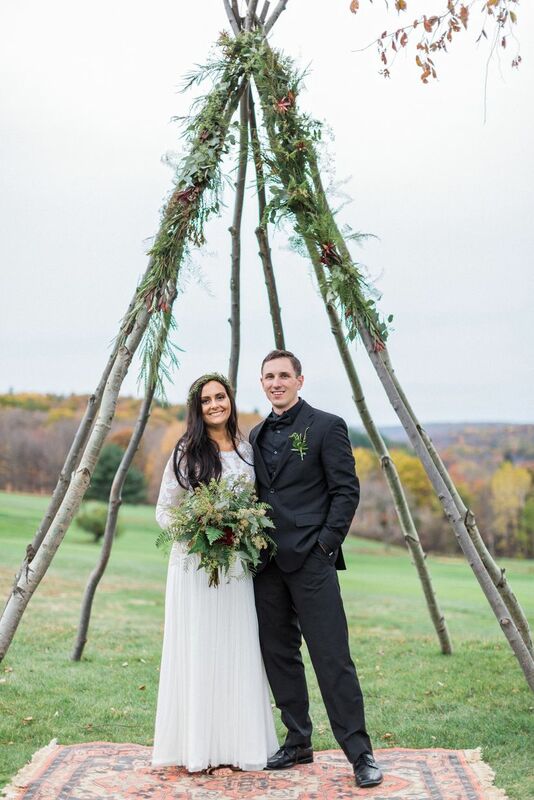 For the ultimate boho-chic ceremony décor, consider a teepee-shaped altar of branches and flowers, like this couple who got married at Copake Country Club in Upstate New York. You could even embellish it with dream catchers, macramé, or colorful ribbons. 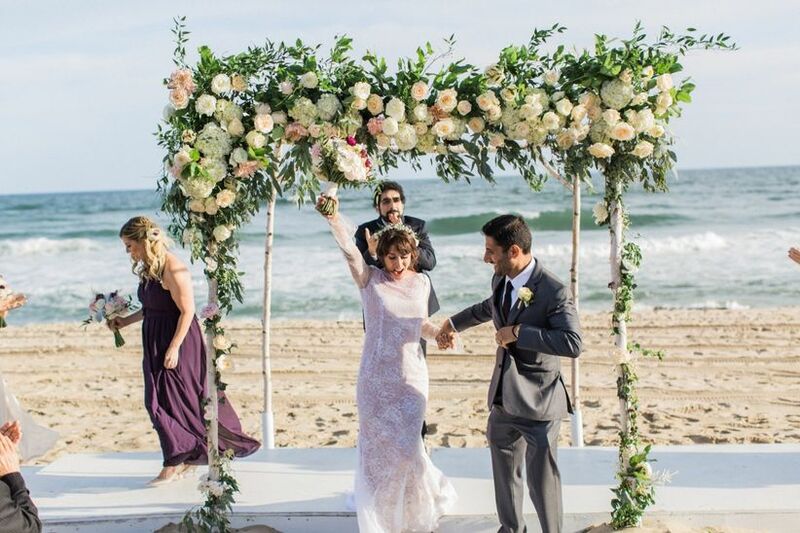 If you’re getting married on the beach, that doesn’t necessarily mean that you need to forgo a fancy floral chuppah. 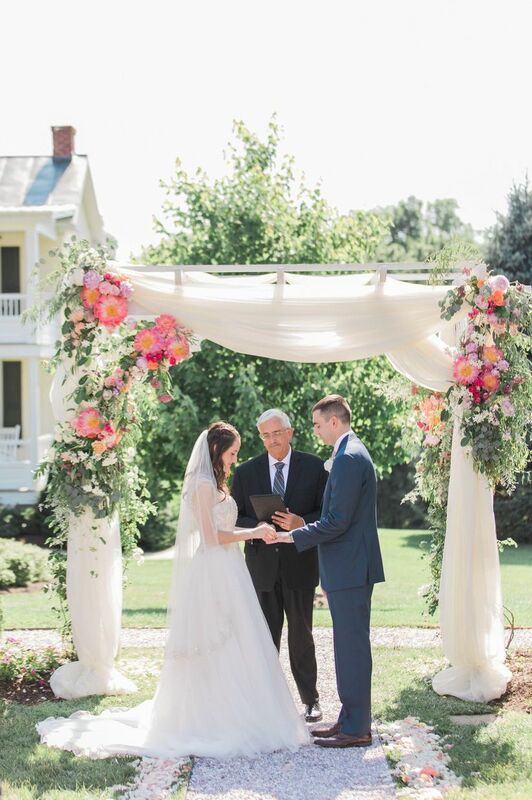 We adore the light and airy feel of this canopy whose “poles” are wrapped with flowers and vines. 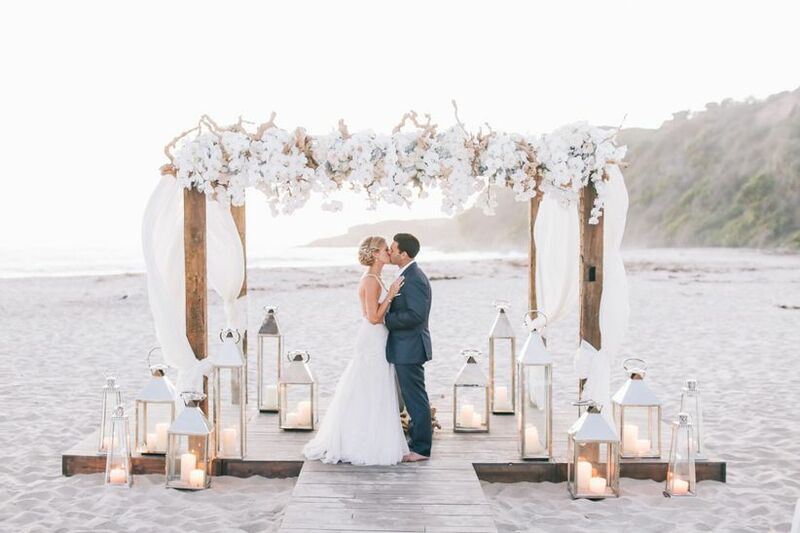 Bloom Box Designs blew us away with this beachside ceremony structure consisting of driftwood and cascading orchids. 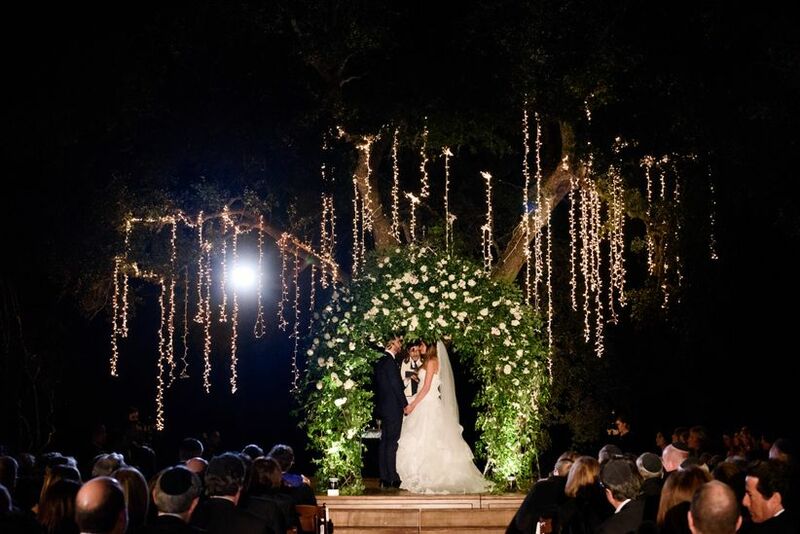 Lanterns and a custom wooden aisle round out the picture-perfect scene. 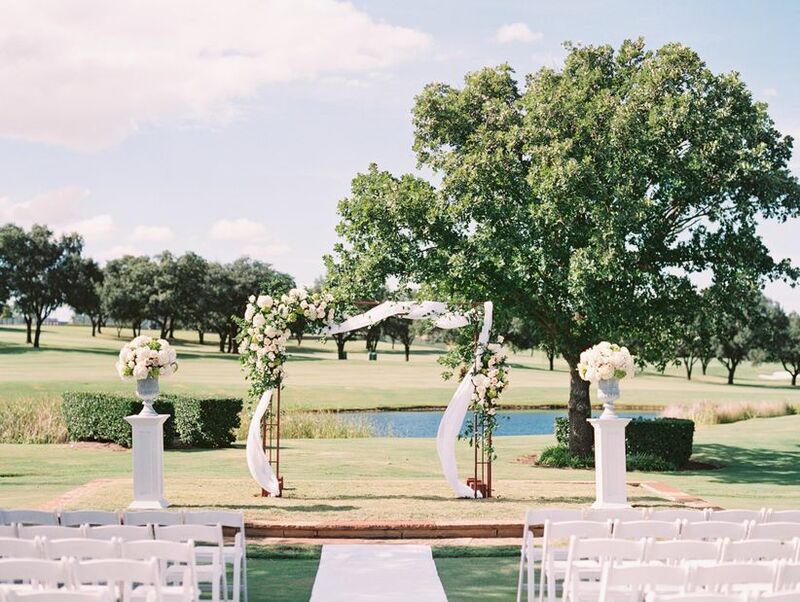 An all-white ceremony setup is ultra-elegant and allows the natural scenery to shine. We can’t stop swooning over the crystal chandelier and braided chair backs. 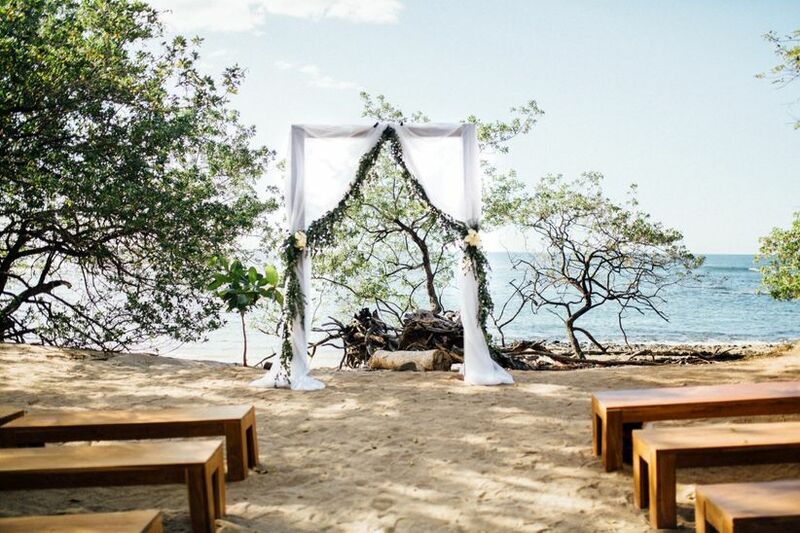 FourNineteen Weddings lined a sheer white altar with swaths of greenery for this beachside fête in Tamarindo, Costa Rica. 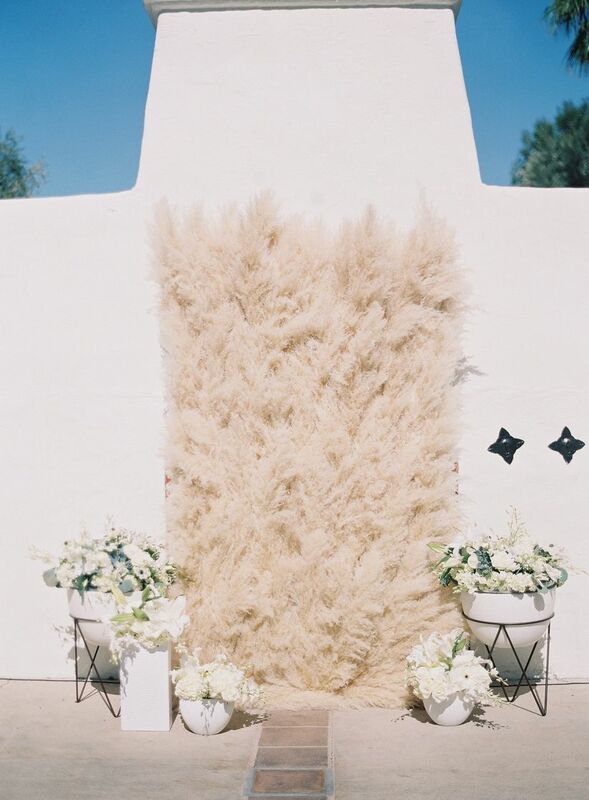 You could achieve a similar dreamy effect at your wedding entryway with curtains and eucalyptus. As you can tell from this list, greenery galore is on-trend for 2017 and shows no sign of slowing down. 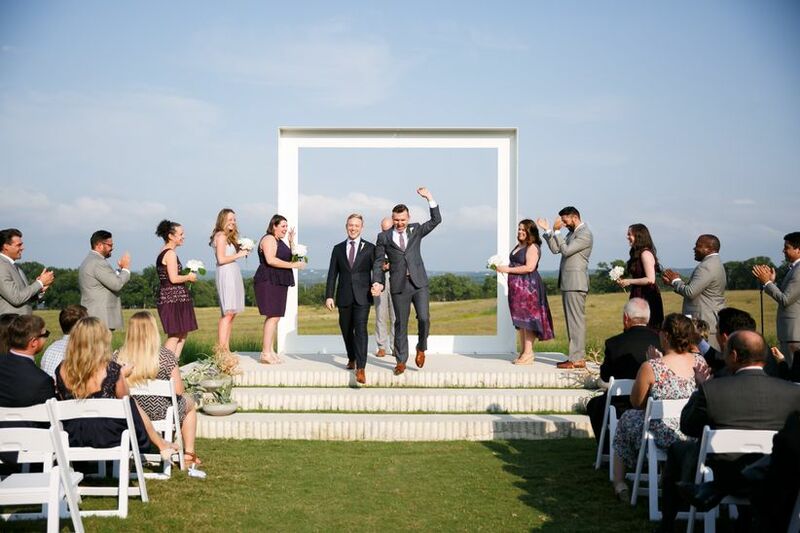 We’re digging the playful and modern vibe of this ceremony combining an asymmetrical altar with flower-topped Lucite chairs closest to the aisle. Go off the beaten path with a textured wall made entirely from pampas grass! 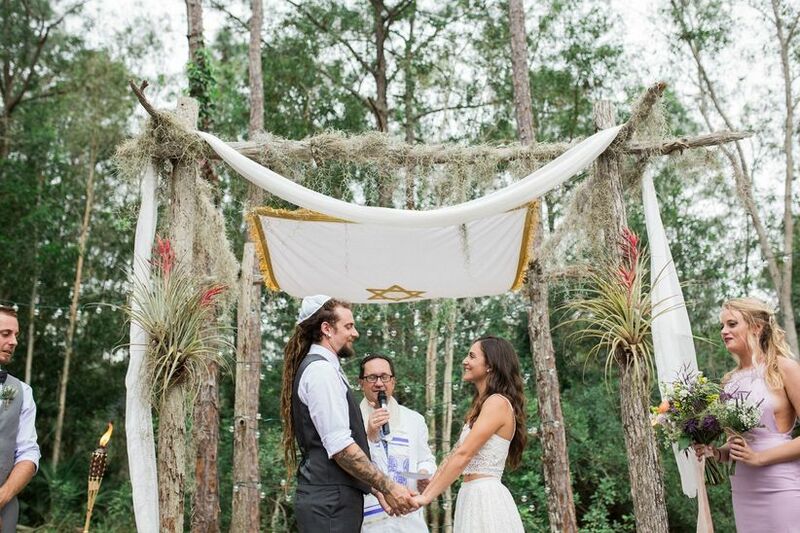 Rock Paper Details was the mastermind behind this boho-chic ceremony décor. If your big day will take place during the autumn, then you’ll want to add this next photo to your ceremony Pinterest board ASAP. A pile of white pumpkins and corresponding monochromatic floral arch are a match made in heaven. Can we just take a moment to admire this nighttime ceremony? A tree wrapped in strings of twinkle lights is a high-impact way to show off an oversized floral arch.